Embed this video on your site/blog. 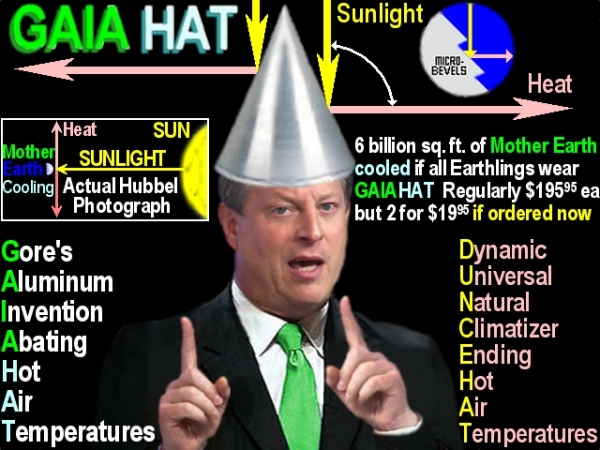 Gore's latest invention to save Mother Earth from getting "too hot" is mainly known by its acronym, "GAIA HAT," which stands for "Gore's Aluminum Invention Abating Hot Air Temperatures." It's also known by an alternate acronym, which stands for "Dynamic Universal Climatizer Ending Hot Air Temperatures." How does it work? It defects heat from sunlight harmlessly into space. 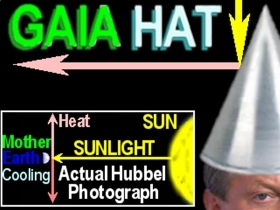 Skeptical scientists pointed out that "the angle of incidence always equals the angle of reflection" and that, therefore, the shape of the GAIA HAT would deflect sunlight downward toward Earth rather than into space. 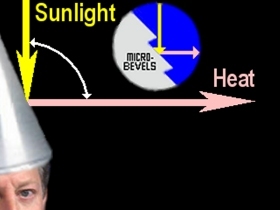 Gore extinguished such skepticism by explaining the GAIA HAT's high-tech design: Covering its entire surface are microscopic bevels so that the angle of incidence is always 45° and thereby guarantees the angle of reflection is always 45° so that the heat from sunlight is deflected horizontally through Mother Earth's atmosphere to pass harmlessly into space. "Ingenious," said the now formerly-skeptical scientists, after studying the technical diagram of Gore's "micro-bevels" (above right) as well an actual photograph recently taken by the Hubbell Space Telescope (above left). 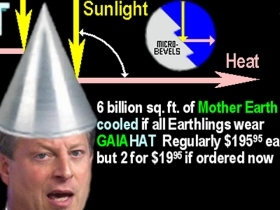 Although a GAIA HAT is valued at $199.95 each, Gore is philanthropically making them available to the public at the sacrifice price of two for $19.95 via infomercials known as "Mother Earth Informational Nuggets Keeping All Mortals Progressively Following" (MEIN KAMPF). 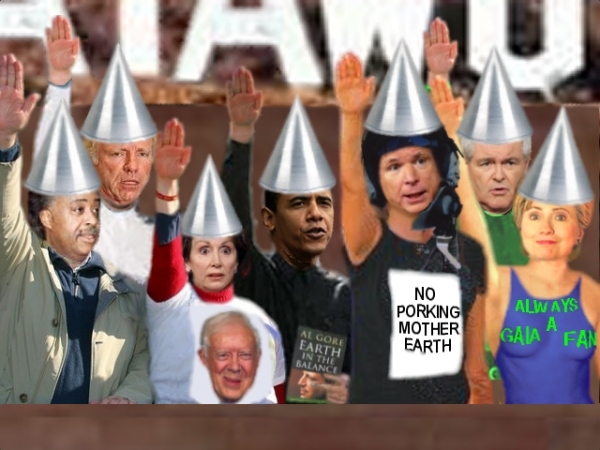 The MEIN KAMPF infomercial for the GAIA HAT inspires the masses to derive joy from the collective power of 6 billion people cooling Mother Earth by wearing the hat. Anyone who's been watching the History Channel, the Science Channel and the Discover Channel knows that "for the public good" all those channels are now inserting into almost every program brief but subtle assertions of the dire consequences of Earthlings failing to heed Gore's warnings based on what has now been legitimized by the Nobel Prize Committee as the Official Scientific Orthodoxy of the 21st Century: HuMANs Must Stop Getting Mother Earth Too Hot. 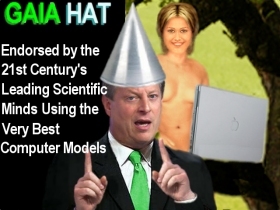 Gore also released an "infomercial" video not only marketing the GAIA HAT and showing how it works but also unveiling the Gore Foundation's recent, highly-secret launching of The Gorbels Cube into orbit to help cool Mother Earth by eclipsing the Sun once each orbit. Said Gore, "keeping that secret until the orbiting Gorbels Cube became operational was quite a challenge." Above is the GAIA HAT video in YouTube's format. The best quality embeddable version is in the original wmv format at http://PoliSat.Com/GAIA_HAT-HQL.htm. One of the results of Gore's tireless work to prevent the dire consequences of his warning being ignored is that he has earned the title "GAIA HOME," which stands for Gore As Infinitely Attentive Husband Of Mother Earth." 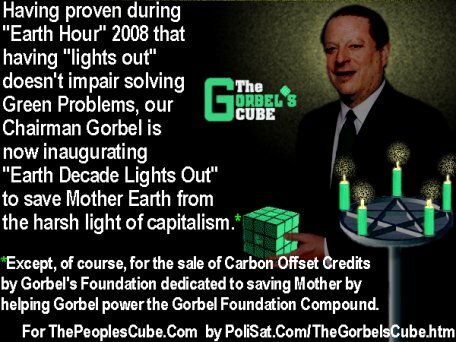 This honor was first revealed in the wake of the highly successful "Lights Out Hour" for 2008 when Gore simultaneously unveiled his creation of "The Gorbel Cube" and announced his proposal for a "Lights Out Decade." In that same event, Gore also provided startling insights to refute what he says his skeptics claim-- i.e., that "Mother Earth is Flat." 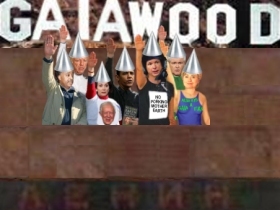 However, a faux controversy promoted by bitter critics who "cling to Puritanical Beliefs" initially (but, thank Lenin, only briefly) marred the premier viewing of the GAIA HAT video. The "controversy" arose from the segments illustrating Gore's assertion that the scientists who formulated his humans-cause-Global Warming theory used "the best computer models." Fortunately, the infinitely cool "MacBoy" made an appearance in the Garden of Edenization to quell this controversy as the nerdy PC Guy was trying to disrespect GAIA. The nerdy PC Guy had falsely (and stereotypically) suggested it would be proper to try to find a "hole" in GAIA, but MacBoy devastatingly exposed the patently misogynistic nature of PC Guy's behavior. 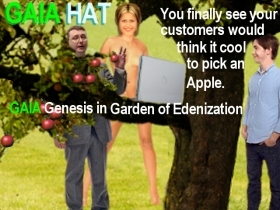 (PC Guy picked the apple to expose GAIA and lead to the revelation of a "hole" in GAIA.) But the unflappably cool MacBoy quickly countered PC Guy's efforts by stressing the importance of the "wholeness of," rather than any "hole in," GAIA.) Soon all humans will learn that it's the coolness of advocates of Global Science that make it scientifically sound rather than the old-fashioned "scientific method," which Modernist equate with those boring, nerdy scientists still "clinging" to the now-outdated maxim, "facts first, then conclusions." Perhaps the most brilliantly stunning part of the video is the segment capturing The Gorbels Cube eclipsing the sun. 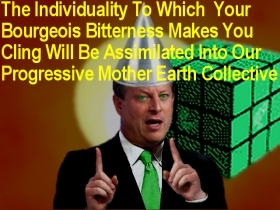 Said Gore, "Designing, building and launching into orbit The Gorbels Cube while maintaining total secrecy until it became operational was a challenge not unlike it would have been if the United States were to have kept the Apollo Moon Program totally secret until after Armstrong set foot on the moon. That we did it, however, is testament to how much we've remained true to the collectivist wisdom exemplified when The Party kept Yuri Gagarin's historic mission completely secret until it became operationally successful. The video also captures the rapture of the Creative Geniuses among us who witnessed the first eclipse of the sun by The Gorbel Cube. Watching the eclipse gave them goose-bumps and caused them to momentarily break into goose-steps, but they quickly recovered and resumed their positions in the Gorbel Salute. Robert Redford, whose Sundance Ski Resort already plays a vital role in cooling Mother Earth (skiers know that snow-covered slopes reflect sunlight and heat) by marketing ski chalets socially-responsible ways to get Carbon-Offset Credits from the Gore Foundation. Perhaps the most excited person was Cheryl Crow, who, after witnessing the awesomeness and coolness of the eclipse asked, "Will this be so effective in cooling Mother Earth that I will no longer need to follow my "1SPSTSME" regimen?" Hearing that, Rosie O'Donnell asked Michael Moore, "What's a '1SPSTSME regimen'?" Moore said, I've never been able to follow that regimen because I'm so much larger than Cheryl, so the best I can do is follow a 1000SPSTSME regimen." Rosie said, "But you still haven't told me what "1SPSTSME' stands for." 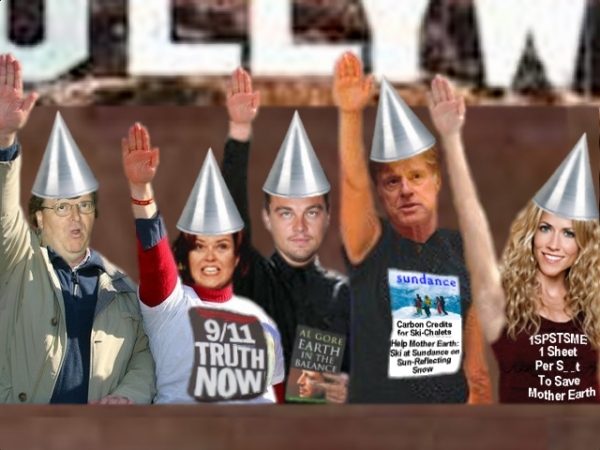 It was then that Leonardo DiCaprio, to save Michael Moore embarrassment, whispered to Rosie that it means "One Sheet Per S__t To Save Mother Earth,." Perhaps the most encouraging part of the video was the finale which revealed how much GAIA HOME's pioneering science has become accepted by so many of Mother Earth's now-fomer prodigal sons and daughters. See image to the right; also, scroll-down further (or click here) for a larger view. This includes such luminaries as Al Sharpton, Joe Lieberman, Nancy Pelosi, Barack Obama, John McCain, Hillary Clinton and even Newt Gingrich. Others unable to attend this event and who had sent their sincere regrets over being unavailable include The Governator as well as Right-Wing Evangesist Pat Robertson, who is Sharpton's "team mate" in new "Global Warming Will Kill Us All If We Don't Stop Getting Mother Earth Too Hot NOW" commercials funded by Chairman Gore's beneficent generosity and philanthropy. The ending of the video bodes well for the future of The Collective. It's powerful message gives us the audacity to hope that in the near future, all skeptics will have become assimilated into what Chairman Gore tells us is now a First Principle in Twenty-First Century Orthodoxy. In the interim, however, Chairman Gore is developing a second Gorbels Cube soon to be placed into orbit. 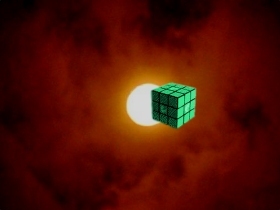 This new Cube will be much larger and will not only double the number (and effects) of eclipses of the sun but will also house those anti-social "deniers" of the Truth of GAIA HOME's theory, known by the acronym "WHAM-BAM METHANE," which stands for "Woman-Hating, Anti-Misanthropic Bullies And Misogynistic Men Are Making Mother Earth Too Hot And Naked Environmentally."